Chelsea again bounced back from a disappointing result to put Derby to the sword in emphatic style. 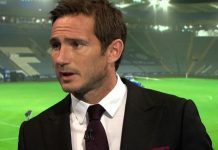 Frank Lampard scored four goals for the first time in his Chelsea career, with Kalou and Joe Cole also netting to make the final score 6-1 at Stamford Bridge for the second time this season. Discuss the game in our match day forum: Chelsea 6 – Derby 1. Previous articleDERBY NEXT TO HUMBLE CHELSEA?